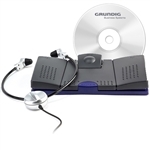 Here you will find a Range of Digital Transcription kits that will allow virtually any Digital Speech File to be Transcribed with the addition of Fast Forward and Rewind Capabilities. Most of our Digital Transcribers are supplied complete with Digital Headset, Foot control and Digital Transcription Software. .DSS being the (Digital Speech Standard). However other file formats such as .WAV, WMA and MP3 Dictation Speech Files can be played through all of the Olympus Digital Transcribers.